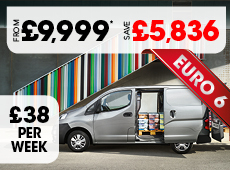 Our Leasing Offers Are On Vans That Are In Stock Now! Cash Flow – you can use your van immediately whilst allowing payments to be made on a monthly basis, providing your business with better cash flow. Repayment period flexibility – you choose a finance repayment period of up to 60 months. Fixed monthly repayments – your monthly repayments are fixed for the whole term of the agreement. Low monthly repayments – you choose the deposit you put down, but the more you pay, the lower your monthly repayments. Tax advantages – if you're VAT registered, you can reclaim the VAT payments made within the monthly payments. Mileage restrictions – No mileage restriction unless you opt for a terminal rental in which case only a mileage estimation is used. Equity – you retain approximately 99% of the equity in the vehicle.